15 3/4" [400mm] door opening accommodates larger wares, including trays! 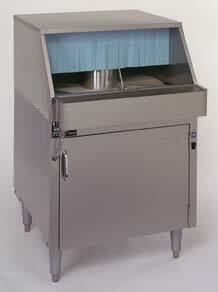 Fully automatic wash/rinse cycle washes and sanitizes a rack of wares in 140 seconds. 21 racks an hour. 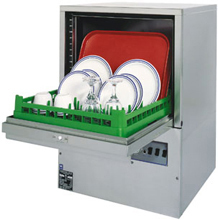 The DF Series glasswashers provide high volume, top quality performance in a compact, single unit. 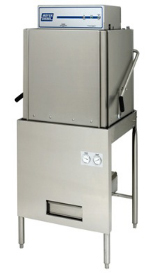 Injector system allows the use of separate sanitizer and rinse aid resulting in real savings. Precisely calibrated pumps inject just the right amount of chemical each time - no guesswork - no waste. 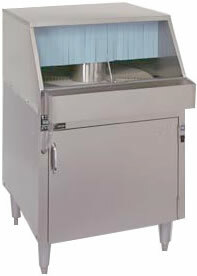 High Performance - cleans & sanitizes 1000 glasses per hr. Cool Water Final Rinse - insures steady supply of clean, cool glasses ready for immediate use. 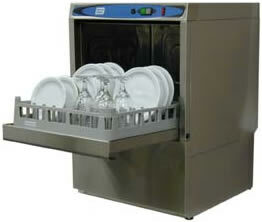 Upper & Lower Wash & Rinse Arms - produce sparkling clean glasses every time. Easy to Clean - spray arms easily removed; scrap screens catch trash. Built-in Three Pump Injection System - uses chlorine or iodine based sanitizer. 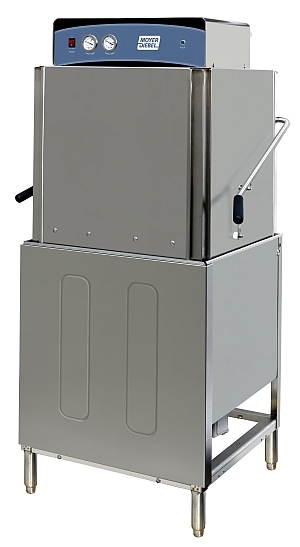 Polpropylene Rotary Conveyor - virtually eliminates chipping of fine stemware. Double Wall Construction - for quieter operation. Automatic Operation - glass activated shut-off switch saves energy, chemicals and water. Splash Shields - for splashover protection. Off-the-floor Shelf - provides storage for three, 1-gallon containers. The DF, DF-1 and DF-2 all provide high volume, top quality performance in a compact, single unit. Glasses are conveyed through the all-welded construction wash and rinse tunnel in the upper section. The lower section houses the drive mechanism, tank, storage shelf and field connections. 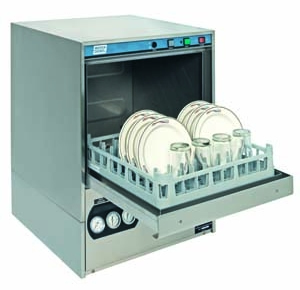 The superbly compact design and high throughput of the DF series allows them to be used in place of 3 or 4-bin sink units. Water and power consumption is relatively low, yet the glasses emerge cool, sanitized and sparkling. 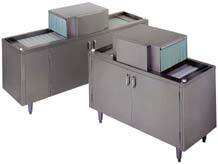 T-Bar and Corner installations allow 1-1/2'' clearance between hood top and under side of bar top. Spray tube clean out points are located on top for easy cleaning and to ensure that bar wall or other equipment do not interfere with accessibility. On T-bar installation, a hinged panel on bar front allows easy access to component parts. Besides the DF series for limited space areas, Moyer Diebel offers the SW series, high volume glasswashers for those bigger bar operations. They share many of the DFs' design and operational features. Be sure to visit the pages on this web site describing additional features and benefits of the SW400 and SW600.